A dermyx report. Dermyx is different from existing applications due to its ability to factor in multiple images. Take a picture from an iPhone camera and save various diagnoses. About 232,000 new cases of melanoma are diagnosed worldwide each year, according to the World Health Organization. Melanoma is a type of skin cancer which arises due to in pigment cells called melanocytes . Skin Cancer is the most prevalent cancer in the United States, impacting an astonishing 1 out of every 5 individuals in the nation . Although Melanoma is not the most common type of skin cancer, it causes a large majority of skin cancer deaths , projected to cause over 10,000 deaths in America alone in the 2016 calendar year . Detection of the cancer at its early stages can be vital to preventing the exacerbation of the health issue. Therefore, creating a tool for the rapid detection of melanoma has a profound impact. Areas which do not have access to great health care and physicians can use this application obtain a preliminary diagnosis to determine the severity of their issue and how quickly it must be addressed. 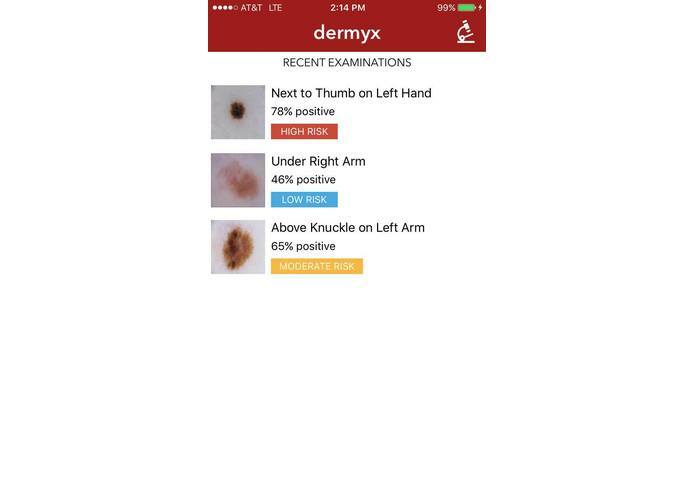 From the comfort of one's home, an individual can take a quick picture of an area on his or her skin inside the Dermyx app. Then the algorithm (which uses machine learning to get trained using a database of full of malignant and benign melanoma pictures) operating in the background of Dermyx will discern and classify the picture taken as either benign or malignant. This project allows users who see their picture classified as malignant to get alert about their potential extreme health hazard and can immediately proceed with further steps. We have also implemented a restful api that allows the user to submit a simple curl request to a server and obtain the same results he or she would through the use of the app. There is also an Electron app that allows the user to access the computers webcamera to complete the same function. Dermyx was built through the integration of many tools. IBM-Watson was essential to the development of this project as Watson's visual recognition technologies were used in conjunction with a database we web scraped  in order to complete the major diagnosis Dermyx conducts. 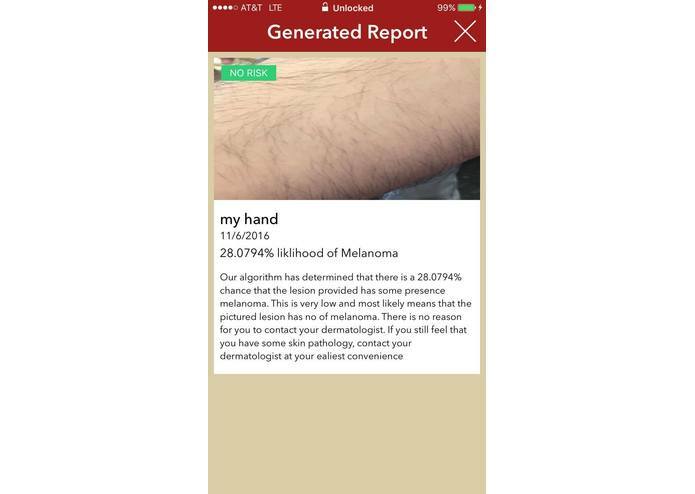 Finding a database with images of malignant and benign melanoma pictures was difficult as the majority of the databases required some sort of medical license in order to obtain access to and the others were present for monetary gain and required large sums of money to be submitted in order to acquire access to them. Additionally, we ran into problems with Watson and configuring Watson to work with our desired threshold. We are delighted to have a completed application which operates at a high accuracy. Furthermore, addressing an issue which applies to such a large portion of the populace is something which we are truly thrilled about. The completion of a project which helps other individuals comes with an additional bonus of a feeling of happiness that we created something which can truly benefit someone greatly. We plan to expand Dermyx to be able to classify other skin cancers in addition to melanoma. Other cancer's we plan to address include basal cell carcinoma and squamous cell carcinoma. Also, improving our algorithm's accuracy and increasing the database of images the machine learning algorithm uses to train itself will be a major concern of ours. This project is not meant to take the role of a physician and a check-up with a health professional should be completed regardless of the diagnosis of Dermyx if the patient believes he or she has symptoms of melanoma present. I wrote the backend and set up the IBM-Watson visual recognition platform. I compiled all the training data and used the watson api to make a custom classifier. I also wrote the entire restful api using Flask and Python which allowed for curl requests to the server for the same prediction which was used by the Electron app. 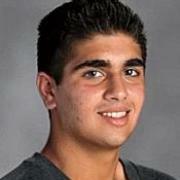 I developed the entire iOS app from the UI to the code in the Swift programming language. I implemented the Watson API through Swift and Carthage. Furthermore, I worked extensively on the Electron desktop companion application with Node.